Whether you know exactly where you want to go with your education or you aren’t even sure where to begin, our Guided Discovery team is eager to help you. We will be with you every step of the way as together we chart a promising course for your meaningful success at Guilford — and beyond. No one goes it alone at Guilford. Every student benefits from a personal team of advisers who provide expert counsel in creating connections between academic interests and career aspirations. You’ll have an impressive network to get you wherever you dream of going. 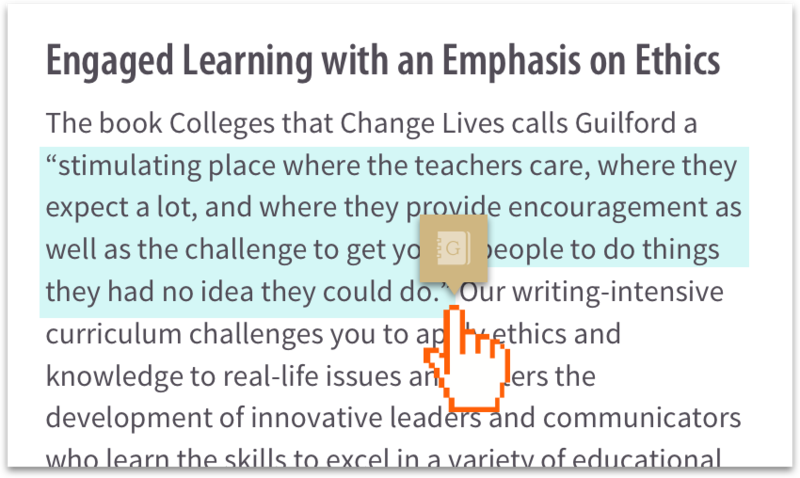 From day one, you’ll have your own Guilford Guide, who will take time getting to know you and your dreams. Your guide will work side by side with you in designing paths for illuminating discovery as you explore your interests, identify life goals and plan for your post-college success. Along the way, you’ll come to trust the considerable wisdom of many others who will join your team: faculty advisers, peer mentors, Guilford alumni, and other career professionals.  They will collaborate closely in making sure you’re well supported and guided throughout your entire Guilford experience and well beyond graduation day. We’ll help you develop the disciplines, study habits, and skill sets necessary to excel as a highly motivated student. 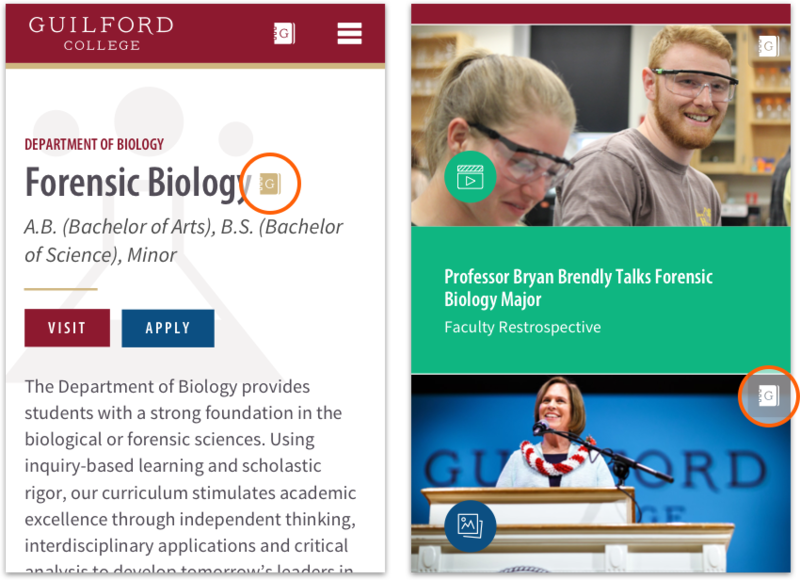 You’ll leverage the many learning resources we offer to ensure you get off to a great start at Guilford. As you dive into real-world learning focused on the issues that matter most to you, we’ll help you make connections between those courses and exciting career possibilities. You’ll become well connected to career experts as you seek out life-shaping internships and study away experiences. Working closely with your own team of advisers, you’ll build a constantly evolving plan that gives you the agility to adapt to your changing interests and opportunities. The whole point is to make the most of every semester at Guilford while gaining the knowledge, skills and experience you need to thrive in pursuit of your life’s dreams. With 40+ majors and 50+ minors — including interdisciplinary courses that allow you to personalize your education — you’re sure to find a program that matches your interests. Customized internships are an important way to gain hands-on experience while earning academic credit. We work with you to help make connections between faculty, employers, organizations, alumni, and other constituents to create an internship that meets your specific goals. Selecting the right major sets the tone for your college career. Let us help you choose your future path with a combination of insightful advising and assessments. Go to What Can I Do With This Major? Quaker Connect is an excellent resource to get employers nationwide to see your resume, and it's where employers can post job opportunities. The College also offers a Graduate School Fair in the fall and a Career Fair in the spring — here's where to find those dates get more and information. Looking for a guide? Read their bios or make an appointment today. Or visit Guided Discovery on the first floor of Hege Library. Get more information about internships, academic and career-planning resources, and a calendar of upcoming campus workshops and networking opportunities. Learn more about Guided Discovery.